Ashok Kumar asked: What is the politico-strategic impact of China's SEZ in Kyaukphyu and the China-Myanmar Economic Corridor on India? Why India has not been able to achieve such advantages in Myanmar? Udai Bhanu Singh replies: China-Myanmar Economic Corridor (CMEC) has been touted as a flagship project of Beijing’s Belt and Road Initiative (BRI) in Myanmar. A memorandum of understanding (MoU) to establish CMEC was signed between the two countries in September 2018. 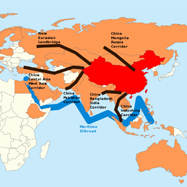 Abhay Kumar Singh replies: China’s Belt and Road Initiative (BRI) is one of the most imaginative and ambitious programmes ever to be rolled out by a government. It represents a broad strategy for China’s economic cooperation and an expanded presence in Asia, Africa, and Europe. BRI has been presented by China as a win-win initiative for all participating nations. At a broader level, the idea of enhancing connectivity across Asia and between Asia and Europe resonates with India’s approach towards regional cooperation. This article argues that Beijing’s ambitious ‘Belt and Road Initiative’ (BRI) is driven by the convergence of Innenpolitik and Aussenpolitik motivations including a desire: to counterbalance perceived American predominance; to ensure economic growth to underpin the CCP’s legitimacy; and to present China as a viable alternate global leader to the United States. Suchak Patel asked: As China continues to encircle India, earlier through ‘string of pearls’ and now the Belt and Road Initiative, why is India still hesitant to form a ‘Democratic Quad’? Prashant Kumar Singh replies: The question posed appears to be based on three assumptions, agreeing to which is a little difficult. First, China is encircling India through ‘string of pearls’ and the Belt and Road Initiative (BRI). Secondly, that the proposed ‘Democratic Quad’ is a response to this encirclement. Thirdly, India is hesitant to form the ‘Quad’ and that it is India’s hesitance alone that is holding up its formation.